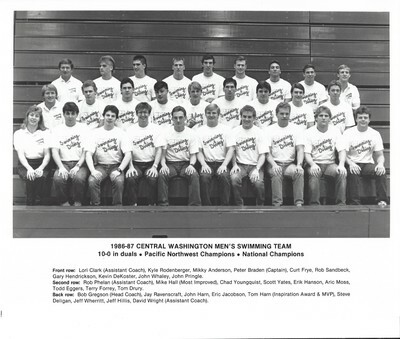 Front row: Lori Clark (Assistant Coach), Kyle Rodenberger, Mikky Anderson, Peter Braden(Captain), Curt Frye, Rob Sandbeck, Gary Hendrickson, Kevin DeKoster, John Whaley, John Pringle. Second row: Rob Phelen (Assistant Coach), Mike Hall (Most Improved), Chad Youngquist, Scott Yates, Erik Hanson, Aric Moss, Todd Eggers,Terry Forrey, Tom Drury. Back row: Bob Gregson (Head Coach), Jay Ravenscraft,John Harn, Eric Jacobson, Tom Harn (Inspiration Award and MVP), Steve Deligan, Jeff Wherritt, Jeff Hillis, David Wright(Assisstant Coach).